Australia's hugely impressive rout of England in the Ashes series so far has not come by chance and the Baggy Greens deserve huge credit for picking themselves up following their defeat earlier this year and responding in the best possible manner. Make no mistake, Darren Lehmann's side have battered England in the three Tests so far and, in contrast to the Three Lions' own win on home soil, the 'contests' in Brisbane, Adelaide, and Perth are actually barely worthy of that description. One team has been on top for the whole series and, save for the very first day at The Gabba, Australia have been totally, utterly dominant. There have been plenty of early inquests into why England have failed so badly but something that has been overlooked in the aftermath is just how have they been able to bounce back and improve against a supposedly crack side - and how on earth have they done it so quickly? Think back to the Lord's debacle just five months ago. Australia were virtually in disarray. David Warner's ugly altercation in a bar with Joe Root a few weeks before and various other reports of inter-team fall-outs were used to explain away a dismal performance while the leadership, quality, depth, and character of the side was rightly being questioned. 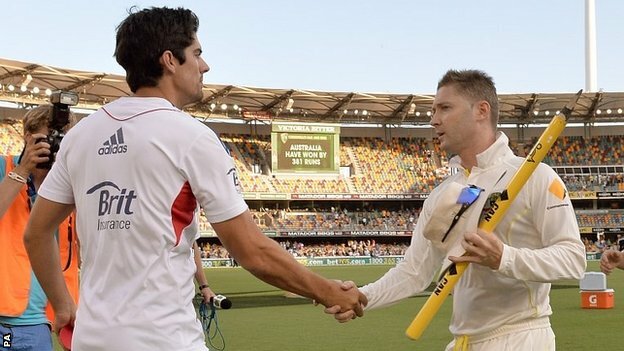 That was the low point and it is fair to say the tourists improved as the English summer went on - in fact, many Ashes betting pundits believe they were unlucky not to return home without at least one Test victory to try to build on. That would have been something positive to take into the home series but, in the end, they did not even need that. Fast forward a couple of months and it's all-change. Lehmann's contribution should not be underestimated - he has overseen a rigorous internal investigation into what went wrong and has prepared a side that has come out not just fighting but growling and snarling. Hours of hard work on the training pitch, instilling confidence into the rejuvenated Mitchell Johnson and Bradd Haddin, and utilising the brilliant captaining skills of Michael Clarke has helped see Australia transformed sharply from a disorganised, under-performing outfit into a highly-drilled, determined and ruthless side, one which England simply haven't been able to live with in the return matches. Yes, Andy Flower's side have let their standards slip, there can be no doubt about that, and the likes of Jimmy Anderson, Stuart Broard, Kevin Pietersen, and Matt Prior have been way off their best but Australia's sheer dedication and commitment to the cause must be applauded. In truth, so bruised were their egos and pride following the 3-0 loss on tour that they simply had to respond. Many were playing for their careers and, finally, redemption has been achieved. So, of course, Lehmann's strategy and coaching, Clarke's organised skippering and Johnson's powerful, aggressive bowling have all been key to the turnaround but maybe old-fashioned wounded pride has been Australia's biggest weapon in this series. So great has the swing been and such is the feel-good factor in the camp that a 5-0 home whitewash - a scoreline that would have been scoffed at just six weeks ago - now looks a very distinct possibility in the cricket betting odds.